#1 New York Times bestselling author Johanna Lindsey presents a spirited Regency-era novel about the transforming power of true love. What will change her mischievous ways: prudence or passion? Ophelia Reid is an incomparable beauty and a ruthless gossip. Having purposely wrecked her arranged engagement to future marquis Duncan MacTavish, Ophelia wants to return to London’s marriage mart and make her own choice of a wealthy husband. But on her journey home, something unexpected happens. . . . The heir to a dukedom, Raphael Locke is the most sought-after young lord in England. When MacTavish claims that Ophelia will never be anything but spiteful, Rafe bets his friend otherwise. Whisking her to his country estate, Rafe shows his furious, sharp-tongued “guest” the error of her ways and discovers the surprising reasons for her bad behavior. When Rafe champions the new and improved Ophelia’s re-entry to London society, marriage proposals pour in. But has Rafe gone and fallen in love with Ophelia himself? 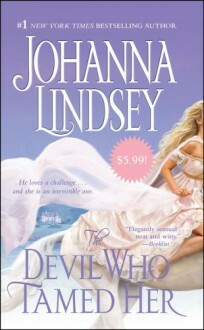 This was one good relaxing book and i finished it after a few hours.This is the second book by Johanna Lindsey which I read and I can't say that I'm disappointed, because I enjoyed reading it a lot.